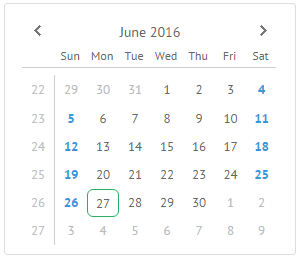 UI-related Calendar inherits from view and allows you to include the Date and Time picker calendar into an app. It is a handy and fully interactive tool to pick the necessary time and date when filling a form. The dedicated timepicker allows setting the necessary time that will be displayed below the calendar area. multiselect (boolean,string) - enables multiselect in a calendar. Can be set to the "touch" value to switch on multiple selection on touch devices. To see the full list of Calendar properties, refer to the corresponding chapter of the documentation. 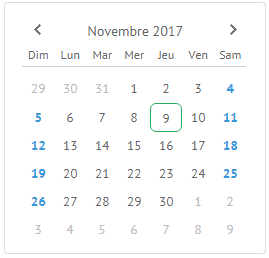 showCalendar(new Date(2012,3,30)); - makes the calendar show the specified date, but doesn't select it. getValue(); - common method for getting the control's value. getSelectedDate(); - calendar specific method. getVisibleDate(); - gets the date even with no selection applied. Date is defined according to the specified rules. To select several dates at a time, use the CTRL+mouse click combination. 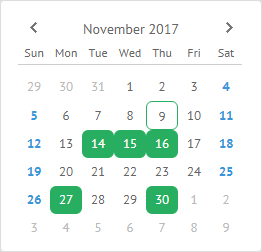 Calendar can be displayed on a customer request, for instance when a user wants to pick a date and time to fill the form. 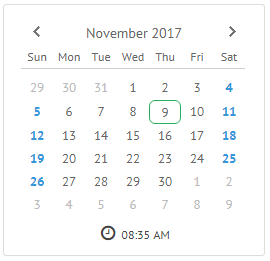 For these needs a datepicker control is used. Note that here you needn't initialize Calendar. 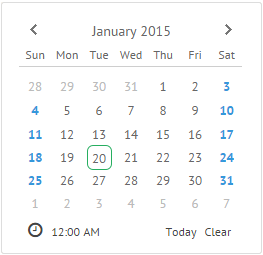 It will appear as soon as you click the datepicker icon. In this case a calendar comes with the current date displayed. Time slots in selector are multiple of 5. The timepicker is hidden by default. To enable it you should set the property to true. Then a timepicker is accessed by clicking the "clock" icon below the calendar grid. 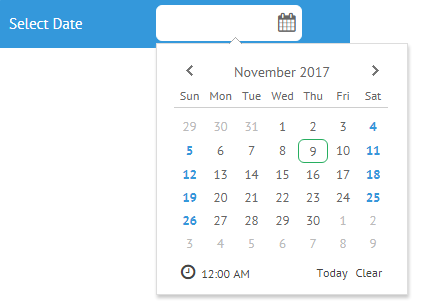 If the new Date function comes with no parameters, the current date and time are shown. 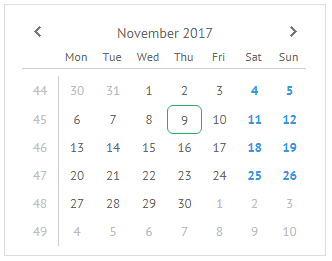 The time view of the calendar is detached from the date selector and is shown separately. To initialize such a control, you should set calendar to the time mode. Like a standard calendar, the time view accepts values as strings or date objects. How do we turn a standard calendar into the one with "foreign" month and day names? Here localization can help you. A locale is a set of rules that tell us how to display months and days. It's a kind of internal "translator" for UI components. First of all you should specify a locale or a set of needed locales (en-US, fr-FR, ru-RU) and then apply them to the calendar. By default en-US locale is used. You need to call the setLocale method to make changes come into force. The dates can be defined either as date object or date string formatted under the current locale. Here the default en-US parseFormat is used, "%Y-%m-%d". The CSS class applied to disabled dates (.webix_cal_day_disabled) can be redefined. 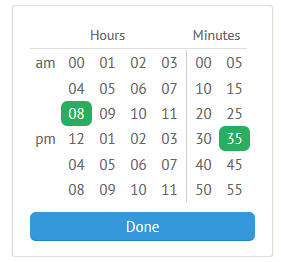 Calendar features a time selector where you can disable time slots. Disabled time slots have specific CSS and don't respond to click events. They should be multiple of 5. The function takes a date object as a parameter and should return true for disabled time slots. The CSS class applied to disabled time slots (.webix_minutes .webix_cal_day_disabled) can be redefined. 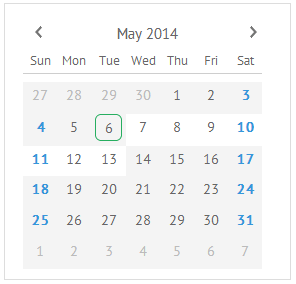 You can add and customize the Calendar icons with the help of the icons parameter. The default icons are "Today" and "Clear".